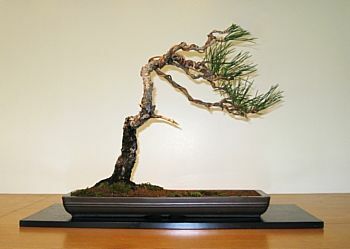 Better Bonsai: "Pining Away: Swept Off Its Feet"
Pity this poor, pathetic pine. It was full of flaws – but it had one great (small?) virtue: its compact size (21" high including pot) made it a perfect travelling companion for a trip to the Potomac Bonsai Festival at the U.S. National Arboretum in Washington, D.C. as demo material. 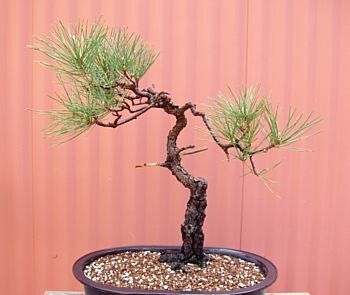 The lonely little black pine had other virtues as well: its radial nebari (surface roots) and its flaky bark. These two features exuded the age and character that can only be achieved over time. But the bottom third of the trunk was straight and almost vertical with a right-angle turn. This abrupt change from straight to curved and vertical to horizontal was dizzying and disconcerting. Part way up the trunk were the remnants of four branches. 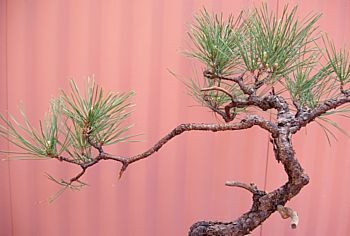 Pines typically send out numerous branches at the same point. Many people (me included) like dead wood on pines. But too many jin (dead branches) going off in too many directions is simply too distracting. Though there weren't many branches, the needles were green, the candles were strong, and the tree was healthy. Interesting movement and nice taper were additional features. But the flaws were in the branching. 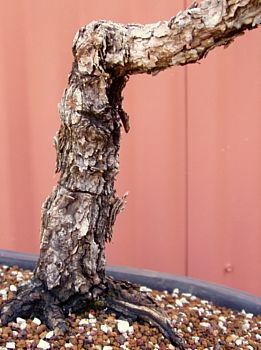 The trunk split off into three branches – two thick and one leggy, long, thin one. Adding insult to injury, there was only a pompom of green at the end of the longest and thinnest branch. I have a particular fondness for bunjin style. 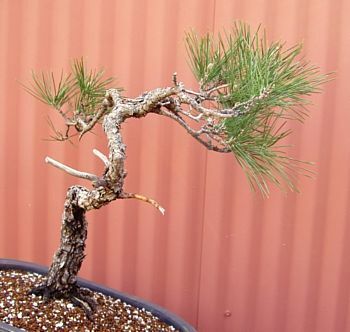 It's the iconoclast of bonsai, breaking the basic bonsai design rules in favor of a freeform style that can range from etherial to whimsical. 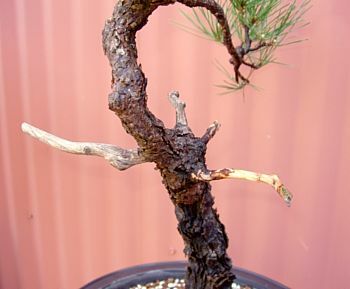 The lack of lower branches and the thin, delicate feel of the trunk are elements typical of bunjin bonsai. With this front and attitude, the trunk has a nice line. The upper trunk comes forward, giving the tree three-dimensional movement. But to get this trunk line, the rootage on the right would be buried and the rootage on the left would be elevated. With wiring, grafting, and repotting, this is how I could see the tree. But the grafting needed on the lower right branch (that long, leggy thing) would take years to complete. I didn't think the observers at my demo would have that much patience, so I went with another design that was better suited to the tree and could be completed in the time allotted. By turning the tree around and leaning it to the right, features are maximized and flaws are minimized. The surface roots radiate outward. The lower trunk is no longer vertical. The ninety-degree angle has been hidden by the new front. With the exception of the branch on the left, all other branches flow toward the right – harmonious with the lean of the trunk in a windswept style. After a one-and-a-half hour demo, the little pine now has a windswept design. The long, leggy branch has been brought around to be the lowest branch. Its length is now appropriate and pleasing. All branches (alive and dead) need to flow with the wind. I've removed or reduced the dead branches that were uncooperative with the new look. Lastly, the tree has been repotted in a beautiful old Japanese pot. The size and shape of the pot perfectly complement the new design. 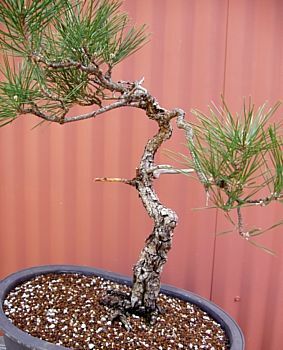 By planting the tree on the left side of the long pot, the windswept branches float above the right half of the pot. This balances the composition and helps draw your eye from left to right. This sketch is my vision for the future. The lower branches need more length while the upper branch needs to maintain the same length.